This was a pretty fun weekend. On friday was George's annual halloween party, which had some late night antics and a lot of great costumes. 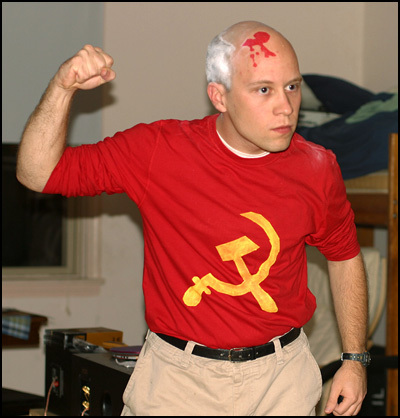 Can you guess which Russian president and Time Magazine "man of the decade" I went as? Party pictures, including illustrations of how to make your own "party" costume (warning: costume is fairly "permanent") are available here: Halloween '05. On saturday I went to a Heinz School party way out in Bellevue, thanks to a tip from Jake D. No pictures from this one, and that's too bad because these folks take Halloween pretty seriously: Accoutrements included smoke machine, two blood fountains, dismembered eyeball candy, hand-shaped ice in the punch, and damn that was a sweet smoke machine. The whole block looked like it was on fire. I mysteriously injured my foot last week right before Brian and Sarah's wedding, which has been driving me nuts all week because I haven't been able to run. But it seems better now, and I guess a week off was good for me, because I beat my best times on the two Shadyside routes that I run by quite a margin, on consecutive days. Based on my pace I could do a 5K in just about 20 minutes now, at least on a mostly flat course. Next year you can skip the red makeup and go as Patrick Stewart. Man Smagill's Napoleon Dynamite is a pretty sweet costume, too. Andrew: You are not the only one to suggest this! I don't think I really look like him, though, so I'd need to put on a star trek uniform. I'm not comfortable with that. The red shirt is almost a star trek uniform. p.s. Post the output of your photography expedition soon. I wouldn't mind a more hilly course, but boy, it sure is convenient to start and end up at your own front door, you know?